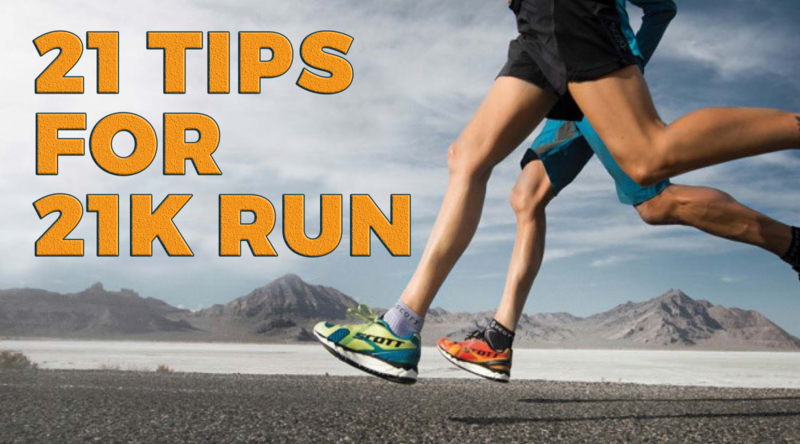 Here’s a quick-list of 21 tips that will help you get going with your 21K run. 1. Be consistent. Physiology rewards consistency. You’re better off doing four days a week every week than seven days one week, and none the next. Try to plan your run at the same time of day as the start of your marathon. 2. Rest strategically. Training alone doesn’t make you fitter or faster. Resting after training does. So plan rest – after hard days, take an easy day. Take one day a week off completely. Plan a rest week once a month, where you still train, but very lightly. 3. Easy means easy. The most common mistake runners make is to do their easy runs too fast. The result is that every day is just slightly too hard, and you’ll have nothing left for when it really counts. If it’s an easy day, go very easy. 4. Everyone needs speed. Regardless of what your target is, doing some speed work will help – it’s all relative. So plan slightly faster running, in the form of interval sessions such as 8 x 2 min fast, 3 min jog, once a week. 5. Test yourself infrequently. It’s tempting to run against the clock and constantly try to improve your best, but this leads to over-training and injury. Don’t test yourself more than once every two weeks. 6. Listen to your body. Regardless of your plan, your body may have other ideas. If you feel flat and heavy, and the programme calls for a long run, listen to your body and give it the rest it is asking for. 7. Don’t go it alone. There are going to be days where you’ll have less motivation than others. Nothing helps like being accountable, and helping someone else through tough days. They’ll repay the favour for you at some stage. 8. Get strong. Weight training has its place, because strength means reduced injury risk. This is particularly true for the core muscles, so look into Pilates or core strength work at least once a week. 9. Look out for over-training. Symptoms included persistent illness, poor quality of sleep, failure to recover after training and progressively worse performances. If that happens, back off for a week and then resume again gradually. 10. Learn about pacing. Don’t be a “dumb” runner – learn how it feels to run at different paces, and know and understand these paces. When you run in a race, or in training, your ability to manage pace is crucial, so practice this consciously. 11. Go for comfort. When choosing shoes and clothing, comfort is the best guide. Don’t be overwhelmed by the vast amounts of information available, rather judge what is comfortable and what works for you. 12. Ask around. As you explore options, seek advice from those in the know. Try liberally, but settle with conviction once you have found the right kit. 13. Run without a watch when you can. On those easy days when performance doesn’t matter, get back to basics and run without fear of targets, time and paces. Save that for when it matters and just run free. 14. Mix up the surfaces. Running is a highly repetitive activity – thousands of similar muscle contractions and landings. Mix it up, and give your body some variety by changing the surface. Run on grass, gravel, or trails when you can. 15. Don’t be too proud to walk. A run can either be a solid hour of running, or you could run 20 minutes, repeated three times with a short 3 min walk in between. There’s little difference in those sessions, but you may enjoy it a lot more and feel a lot better for the walks. So if you feel the need, walk. 16. Relax. Relaxed running is efficient running, and it starts from the top down. Relax your face, neck and shoulders, think of them as the jockey to your legs, and be loose. Reduce the outside stresses in your life as much as possible the last week of the marathon. 17. Don’t stretch passively. Stretching is controversial, but we do know that passive stretching, like touching your toes, for example, does little that is good, and may even increase risk of injury. Rather stretch dynamically with active movements. 18. Walk before you run. Not literally, but it is important to start slow. The destination is 21km, not the starting point, so build up from a conservative base. Get the feel of the surrounding. 19. Set short, medium and long-term goals. The long term goal is 21km, but along the way, set targets – running 10km, achieving certain times, and then reaching the target. Focus on a runner who is 100m ahead of you, pass the runner, then move on to the next one. 20. Understand the impact on diet. The more you run the more energy your body needs. At the very least, you’ll need to eat more, but you may also need to eat different foods. It’s best to see a dietician to make sure you’re replacing what training takes out. 21. Be holistic. Running is one part of your life, it’s not the focal point. Stresses of work, relationship and life can get in the way, and sometimes running is an escape, while at other times it adds to the burden. Understand and accept the big picture, and recognize when you can and can’t devote your energy to running so that it doesn’t consume you.